Iowa State pulled off a miracle Saturday, handing No. 3 Kansas its first loss at home in 55 games. If you thought college basketball was going to calm down after a chaotic Week 13 ... well, you were very wrong. One week after 14 ranked teams lost (including Nos. 1, 2, 4 (twice), 6 (twice), 8, 9 and 10), 11 more fell (including Nos. 2 (twice), 3, 5, 7, 8 and 9). 35-13 -- ranked teams’ record last week, including a 10-7 mark for top-10 teams. 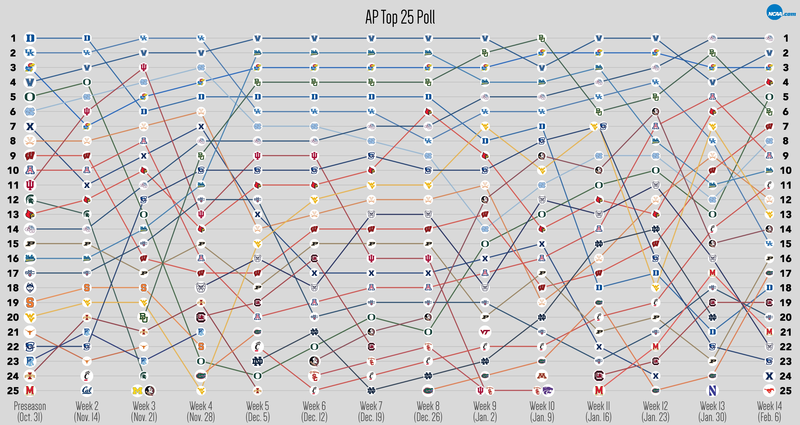 It's a slight improvement from last week's 33-17 mark for Top 25 squads. 10 -- number of upsets in the Top 25. That includes five upsets by unranked teams, and five courtesy of lower-ranked teams. 8 -- spots, the biggest jump this week: by Oregon (No. 13 in Week 13 (Jan. 30), up to No. 5 in Week 14). Last week, the Ducks dropped Arizona State 71-70, then routed No. 5 Arizona 85-58. That's the way to bounce back from suffering an unranked upset (a 74-65 loss to Colorado on Jan. 28). 7 -- spots, the biggest drop this week: by Kentucky (No. 8 in Week 13 (Jan. 30), down to No. 15 in Week 14). The Wildcats are in the midst of a slump, losing three of their last four games, including two upsets. Two weeks ago, it was unranked Tennessee that pulled off an upset. Last week, Kentucky needed ovetime to take down unranked Georgia 90-81, then was demolished by No. 24 Florida 88-66. 4 -- spots, the longest upward streak: by Wisconsin and Cincinnati. The Badgers sit at No. 7 this week, their highest ranking of the season, after a seven-game winning streak. But Wisconsin hasn't toppled a Top 25 team since beating No. 25 Indiana on Jan. 3. Cincinnati is even hotter. The Bearcats haven't fallen since Dec. 10. They've won 14 straight, including an 86-78 win over then-No. 24 Xavier, earning them their highest ranking this year at No. 11. 12 -- teams that have been ranked in the top 5 at some point this year. Those would be Duke (Preseason, Weeks 2, 4-8), Kentucky (Preseason, Weeks 2-4, 11, 12), Kansas (Preseason, Weeks 3-14), Villanova (Preseason-Week 14), Oregon (Preseason, Weeks 2, 14), UNC (Weeks 2-4), Indiana (Week 3), Baylor (Weeks 5-10, 12, 13), UCLA (Weeks 5-11), Gonzaga (Weeks 9-14), Arizona (Week 13) and Louisville (Week 14). 40 -- teams that have been ranked at all this season. 1 -- team that has never dropped in the rankings this year: Gonzaga. The Bulldogs began the season at No. 14 and have steadily climbed to their current No. 1 spot. Gonzaga is the only unbeaten team, sitting at 24-0. 8 -- teams that were ranked in the preseason that have a net-positive ranking movement: Gonzaga (+13: started No. 14, now No. 1), Louisville (+9: started No. 13, now No. 4), West Virginia (+7: started No. 20, now No. 13), UCLA (+6: started No. 16, now No. 10), Maryland (+4: started No. 25, now No. 21), Villanova (+2: started No. 4, now No. 2), Wisconsin (+2: started No. 9, now No. 7), Arizona (+1: started No. 10, now No. 9). 16 -- teams that have been ranked every week since the preseason: Villanova, Kansas, UCLA, Gonzaga, Kentucky, Creighton, West Virginia, North Carolina, Oregon, Louisville, Arizona, Virginia, Wisconsin, Duke, Purdue, and Saint Mary’s. 11 -- spots, the biggest single-week drop: by Duke. The Blue Devils fell from No. 7 to No. 18 between Week 10 (Jan. 9) and Week 11 (Jan. 16). During that span, Duke went 0-2, losing to No. 14 Louisville (78-69) and No. 9 Florida State (88-72). Oregon may have Duke beat in the anvil category. The Ducks plummeted 19 spots in two weeks, from No. 4 to No. 23 with a stop at No. 13 in between (Week 2, Nov. 14 – Week 4, Nov. 28). The Ducks were 3-2 during that stretch, falling to unranked Baylor (66-49) and unranked Georgetown (65-61). 5 -- weeks, the most one team has stayed in the same position: by three teams. Villanova stayed on top at No. 1 from Week 5 (Dec. 5) to Week 9 (Jan. 2) before falling to No. 3 for one week, then jumping back to the top spot. Kansas was No. 3 during that same span before climbing to the No. 2 ranking in Week 10 (Jan. 9). And Duke stayed at No. 5 from Week 4 (Nov. 28) to Week 8 (Dec. 26) before dropping to No. 8.